Here is a list of best free anti phishing software for Windows. These are basically antivirus software which keep your PC secure against various kinds of attacks including phishing attacks as well as malware, viruses, worms, trojans, rootkits, etc. A phishing attack is one of the web attacks which targets to steal your confidential and sensitive information on the web. The data commonly include login credentials, credit card number, etc. This type of attack can be attempted through email scams, malicious links, unsafe websites, etc. In order to keep your system safe from such phishing attacks, you can use these anti phishing software on your Windows PC. Also, if you want free anti phishing extensions for browsers, you can check these articles: Anti-phishing Firefox Add-ons and Phishing Protection Extensions for Google Chrome. These free anti phishing software provide protection against various kinds of internet attacks. Many of these software offer you real time protection against different kinds of threats. You can enable phishing protection as well as general system protection in one click. You get various advanced security tools in individual software which you can watch out for. For example, Safe Shopping, USB Protection, Firewall, Private Browsing, File Encryption, Ransomware Protection, etc. As most of these are featured antivirus software, you can scan your system for potential threats with quick scan, complete scan, and custom scan. You also get a Quarantine feature to view and manage infected files. Baidu Antivirus is one of my favorite software because it provides a lot more security features apart from phishing protection, such as file real-time protection, anti keylogger, webcam protection, screen capture protection, ad blocker, network repair, and more. Bitdefender is another popular antivirus software which provides protection against phishing attacks. You may also like some best free Anti Ransomware Software, Trojan Remover Software, and Internet Security Software for Windows. Baidu Antivirus is a free anti phishing software for Windows. It is basically an antivirus software which also protects you from phishing attacks. Other than phishing, it provides protection for other internet attacks including download protection and anti-hacker firewall. From its Protection section, you can enable anti phishing protection and other types of system protections to keep your system in a secure state. It displays the number of phishing attacks blocked with other statistics like threats detected, file protection stats, etc. It provides a very useful feature called file real-time protection which detects suspicious or infected files in real time and immediately blocks the threat. You get proactive defense and USB protection features too. You can turn on privacy protection in it including anti keylogger, webcam protection, and screen capture protection. To scan computer for potential threats, you get quick scan, full scan, and custom scan (schedule scan) options. Some additional free tools can also be downloaded from its Toolbox section, including Browser Protection, Private Browsing, File Shredder, Ad Blocker, Network Repair, etc. It provides the flexibility to customize settings for individual kind of protections, such as quick, full, or deep detection, enable self defense, file protection mode, password protect critical settings, etc. It is a user friendly antivirus software for Windows which you can use for protection to counter phishing attacks. 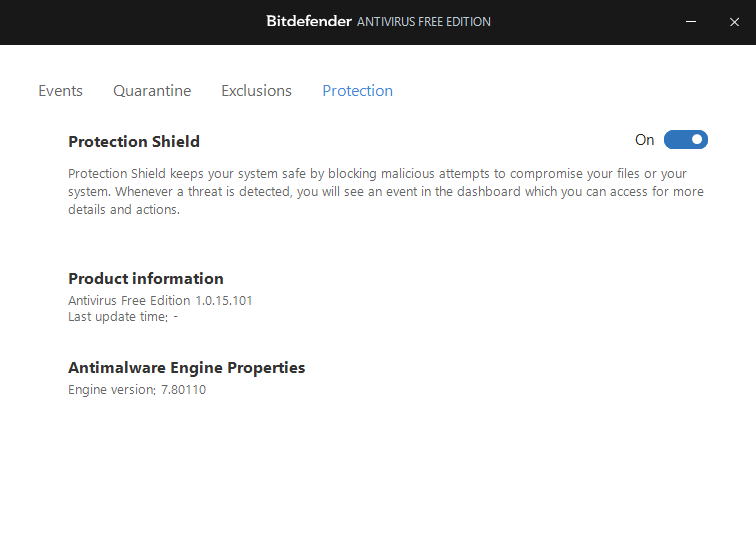 Bitdefender is another free anti phishing software for Windows on this list. As mentioned on its official website, it provides protection against phishing attacks which attempt to steal your login credential while browsing on the web. It provides a single button through which you can turn on the anti phishing and overall system protection. You just have to turn on Protection Shield button from its Settings and it will monitor your system and web to secure you from various attacks including phishing attacks and other web attacks. It contains a Quarantine tab where you can find detected suspicious or infected files. From its Exclusion tab, you can even add a file or website which you want to exclude from being scanned, which you know are safe. It detects and removes threats including malware, ransomware, trojans, rootkits, spyware, etc. It protects you from scam websites to prohibit loss of sensitive financial data on the web. Its free version is quite limited in terms of security features. With the paid versions of this software, you get a lot more security features including Wi-Fi Security Advisor, VPN, File Shredder, Parental Control, File Encryption, etc. It is quite a popular antivirus software which provides a free version too in order to keep your system secure from attacks including phishing ones. 360 Total Security is yet another anti phishing software for Windows and Mac. It provides protection against phishing attacks, malware, trojans, data theft, etc. You can perform a full PC check and virus scan in order to detect system health and potential threats. It scans system settings, running processes, startup items, system critical files, and more to find out issues which your PC is dealing with. Thereafter, it resolves the detected issues to keep your system in an optimal state. From its Scan Log, you can view records of web threats, downloaded files, behavioural blocking, online shopping, etc. It provides a Sandbox in order to run suspicious software in a virtual environment so that the system is not harmed. You get real time protection against viruses in it so that your PC is always secure. You can scan your system for potential threat using quick scan, full scan, or custom scan option. A Quarantine is provided to manage files and programs that are detected to be malicious. The free version has several limitations. For example, firewall, ransomware, cyber attacks, and more protections are disabled. You need to upgrade to its premium version in order to utilize its advanced features. 360 Total Security is a famous antivirus software for PC and mobile phones which helps you keep your system secure. Avira is the next free antivirus software which also provides protection against anti phishing attacks. It provides real time protection on your PC and you can also start a scan for detecting infected files or programs. It provides a “Browser Safety” extension for Firefox and Chrome browsers to protect your browser activities and prevent your information (login ID, passwords, etc.) from getting stolen. It also provides a Safe Shopping feature which basically searches good shopping deals for you while excluding untrustworthy ones. You get Phantom VPN option to browse the web safely and anonymously. It provides Software Updater in order to keep your Windows software and drivers up to date. You can install some extensions for Chrome and Firefox browsers including Password Manager (manage your passwords across various devices) and Avira SafeSearch Plus (get warned for malicious sites). It can also block familiar ransomware. You can fix the detected security threats on your system. This free version of Avira contains lesser features as compared to the pro version, e.g., protection against emerging ransomware, scanning email attachments, etc. Also, the free version contains ads. It is another anti phishing software which you can use without much hassle. Note: It installs third party software which you can disable while installation process. Thunderbird is an email client which provides protection against phishing attacks. This software primarily focuses on email scams which lure people into giving away their private information. This is one of the most common kinds of phishing attacks. It also alerts you when you try to click on a link which is possibly a phishing attack. It provides you privacy and remote image protection. You can add and manage multiple email accounts in it. It provides more advanced features like Search the Web, Quick Filter Toolbar, Search Tools, Tabbed Email, Message Archive, etc. You get an Add-on Manager too. Thunderbird is a free open source email client which protects you against email scams which attempt phishing attacks. So, you can use it to manage email accounts securely.